Thursday 5 April 1pm to 4pm at Granville Recreation Centre Gingin. 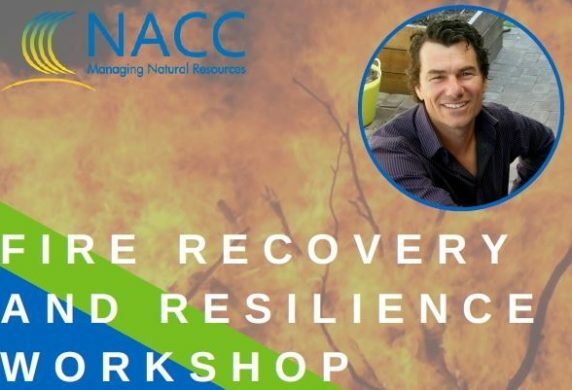 The Northern Agricultural Catchments Council in association with the Forever Project and with funding from the State NRM Program, is hosting an interactive Fire Recovery and Resilience Workshop in Gingin at the Granville Recreation Centre on Thursday 5 April between 1pm to 4pm. The event has been designed to help people with small blocks who are living in the Shire of Gingin and surrounding districts but also offers information of benefit to large-scale farmers and other Shire residents. The workshop will feature the award winning ABC TV and radio gardening presenter Dr Chris Ferreira. NACC is inviting members of our community, especially those living at the bottom end of our region, to take advantage of this free event. Place are limited, so please secure your place now by RSVP your interest to Stanley Yokwe at Stanley.Yokwe@nacc.com.au or by mobile 0428 649 775. MEDIA CONTACT: Ellie Honeybone – Ellie.Honeybone@nacc.com.au or call 9938 0124.